Greenpeace co-founder Patrick Moore had harsh words for the modern environmental movement, calling global warming “the greatest scam in history” and denouncing the use of “fear and guilt” to push the message. This abomination that is occurring today in the climate issue is the biggest threat to the enlightenment that has occurred since Galileo. “CO2 is the food for life! It’s not pollution,” the would-be heretic declared, claiming that the use of fossil fuels had actually “saved life from an early demise” because CO2 had been declining since the last ice age, with barely enough for the earth’s plant life to sustain itself, until humanity stepped into the breach during the Industrial Revolution. Moore, who founded the pioneering environmental activist group almost 50 years ago to protest nuclear war, met with an outpouring of support from conservatives and weary Democrats alike, after tweeting a scathing rebuke earlier this week to Alexandria Ocasio-Cortez, whose quixotic Green New Deal has become the standard-bearer of the 21st century environmental movement. He continued along those lines, criticizing the anti-climate-change movement for “co-opting and corrupting” politicians and allowing the environment to be treated as a political football without understanding of the meaning behind the rhetoric. But Moore reserved his harshest words for the Sunrise Movement he believes is backing Ocasio-Cortez. They’re brainwashing these children into thinking the world is coming to an end in 10 years. There’s got to be billionaires behind this. I want to know who they are. I think we need to hunt them down. This is a very good article on an important topic. There has been a lot of unfounded hysteria surrounding climate change none of which is based on reality. Every time we exhale it is carbon dioxide we emit which a necessary plant food and of course it is balanced out because plants exhale oxygen. I grew up in the fifties when there was far more air pollution as a result of people factories transport etc all burning coal to produce energy. I agree this is a main agenda item for the super rich elites to extract more wealth from the system in the form of carbon taxes and who knows what else motivates them in this matter . Great interview – but I was pissed I couldn’t find a way to download this important audio file. SoundCloud used to have a download to disk button I think – but now it’s apparently gone and the file appears to be a ‘streaming’ type of thing that is chopped up into short chunks. If you have theory it should fit known facts. The manmade global warming theory does not meet that basic standard. 16,000 years ago there was a thick ice shee over most of America and Europe. It melted rapidly, over about 1000 years. Sea levels rose by over 300 feet. This was long before mankind was burning coal and oil. In Britain in the 12th and 13th centuries the climate was warmer than it is now. Grapes and wine was produced in the North of England. In the 16th and 17th centuries the climate became much colder, and it then started to warm in the 19th and 20th centuries. For ninety percent of the last million years, the normal state of the Earth’s climate has been an ice age. Ice ages last about 100,000 years, and are punctuated by short periods of warm climate, or interglacials. The last ice age started about 114,000 years ago. It began instantaneously. For a hundred-thousand years, temperatures fell and sheets of ice a mile thick grew to envelop much of North America, Europe and Asia. The ice age ended nearly as abruptly as it began. Between about 12,000 and 10,000 years ago, the temperature in Greenland rose more than 50 °F. 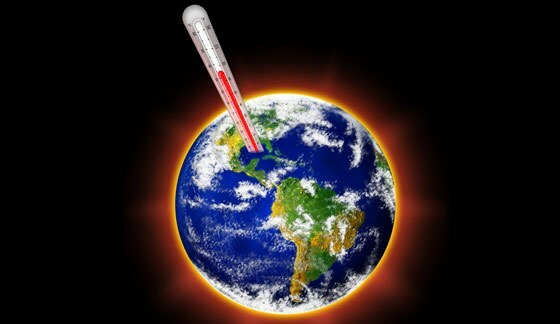 NOBODY REALLY KNOWS WHAT CAUSES THESE BIG CLIMATE CHANGES, BUT THEY WERE NOT RELATED TO MANKIND’S USE OF FOSSIL FUELS.